Well, slightly later than is ideal, here's our agency update for February. We did get the email out on time, though! We’re pleased to be able to carry on our busy start to the year with further new project announcements below, which as you can see, have something of an ‘education’ slant to them. We’re also thrilled to be able to show updates on some of the work we mentioned last month, for example the 2018 Macclesfield Barnaby Festival and the “Portraits of Port Sunlight” exhibition, both of which launched recently. First off, our long standing relationship with Alliance Manchester Business School. AMBS have kicked off their exhibition programme for 2018 and as ever, Ingenious are more than happy to get the show on the road. We are thrilled to have worked with the Executive Education function at AMBS since 2010, and during that time have worked hard to immerse ourselves in their work and what can on occasions be quite a complex ‘offer’. As a result, we have been able to deliver a range of print, digital and, as you can see here, exhibition work for this most interesting of clients. Long may it continue! Another education client we have worked with extensively is adult education establishment, Wilmslow Guild. Since 2012 we have been supporting their senior leadership team as they move the Guild in a new and exciting direction. 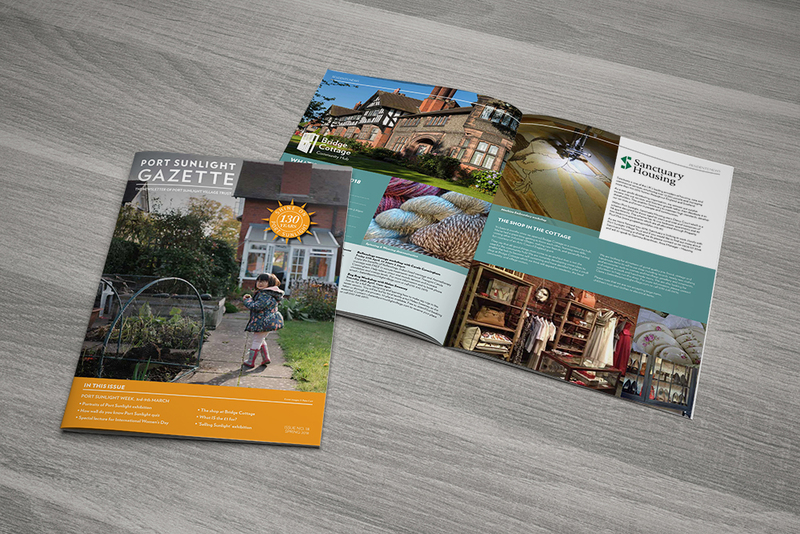 Our work has included design of their annual prospectus, and more importantly their website has been a key part of this process, and we’re thrilled that we’ve made a contribution in seeing the Guild go from strength to strength. Since its introduction, the website (in conjunction with our fantastic development partners) has been continually updated and refined to offer a first class user experience and also provide WG’s team with powerful reporting which integrates with their financial systems. For 2018-19, we’re thrilled to be able to not only continue developing the site further, but also designing an entirely new Prospectus which, as well as continuing to communicate the diversity of courses and events the Guild have to offer, will work much harder as a marketing tool. We can’t wait to get started! Portraits of Port Sunlight is an exhibition of images by local photographer Pete Carr and for which we were happy to design the interpretation and supporting graphics. Sadly, due to Macclesfield being snowbound recently (!) we were unable to attend the opening, but will feature the work at a later date. Pete was commissioned to document modern life in the village 130 years after its foundation, and the result is a series of intimate portraits of Port Sunlight residents at home. The exhibition also includes objects from Port Sunlight’s many clubs and societies, and recent work from their arts and crafts workshop programme. As you can see below, the exhibition was also featured in our quarterly Port Sunlight Gazette. There's a lot going on in our studio just now, but as ever we're always keen to work with clients old and new, so if you have a particular project coming up you think might be suitable for us, please don't hesitate to get in touch. It'd be great to hear from you!